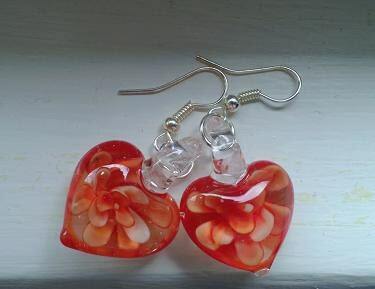 Puffy, bold, orange heart earrings made of beautiful lampwork glass! The hearts measure approximately one inch long. These earrings are perfect for that person who loves to wear browns and earth tones...and has pierced ears. Very lovely! Just as pictured. Got it very quickly. Very cute. Will go with many outfits.